(CNN) – House Majority Leader Eric Cantor continued to strike an optimistic, bi-partisan tone Friday following President Obama's speech on jobs to both congressional houses Thursday evening. "I heard plenty in the president's speech last night where I think that there is a lot of room for commonality and we can get something done quickly," he said during an interview on CNN's "American Morning." On Monday, Sept. 12th, CNN will broadcast the "Tea Party Republican Debate," live from Tampa, Florida at 8 p.m. ET. Follow all the issues and campaign news leading up to the debate on CNNPolitics.com and @cnnpolitics on Twitter. "There's a lot of room for us to work together," Cantor observed. But although the GOP leader believes in the "spirit of working together and building consensus," he stated that issues where Democrats and Republicans may differ should be "set aside"–showing that even agreement comes at a price. "The things we don't like are the things that probably we should set aside and begin to work out here. But again, there's plenty of room for agreement," Cantor said. Common ground between the two parties includes tax relief for small businesses and money for infrastructure spending, but not an "infrastructure bank" or "a Fannie and Freddie for roads and bridges," according to the congressman from Virginia. "Good people can disagree" said Cantor. "Let's try to produce results so the middle class can get back to work in this country." President Obama will travel to Rep. Cantor's district in Richmond Friday and promote his $447 billion plan to stimulate job growth. Cantor will also speak in Richmond at a separate event the same day. Watch American Morning weekdays 6am to 9am ET. For the latest from American Morning click here. Cantor says one thing, but he actually means another. He's only acting statesman like because the President is coming to his district today. I've seen the signs on I-295 calling for Cantor to go. His time is short. Good to read Rep. Cantor is starting to grasp that this nonproductive attitude and behavior is un-American and part of the problem and not the solution. He has done way to much damage and I hope the good people of Virginia replace him. 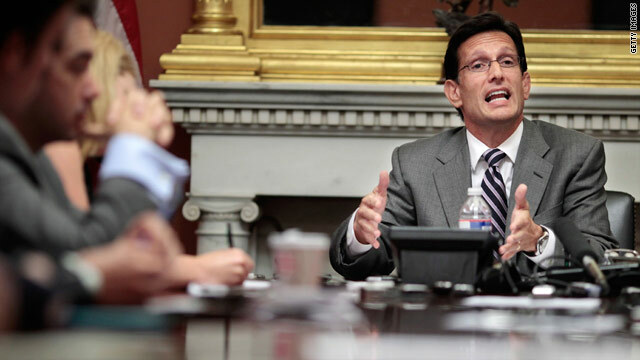 Cantor sees common ground between Dems, GOP??? BS !!! Cantor tactic: cozy up to the prez, then say No. Another replay in the making. As a conservative, much older than you, you little upstart, you'd better find common ground! Because this Republican/Independent will help boot you out of the congress so fast it will make your head swim. Of course he sees common ground. Many of the proposals were once repub ideas. It's amazing how often the repubs hate their own plans after the president says he's for them. I think the GOP leaders are starting to understand that their place in HISTORY was looking really bad. The right now is fun, they are getting a lot of tv time but what will future generations say about their actions and behavior. That is why some are starting to think let us try and make some kind of difference in this time in history instead of just saying NO. Good for them because really they were starting to look again REALLY BAD!!!! Cantor is an embarrassment to his home state. Cantor is not to be trusted. This from Cantor is pretty amazing actually. The underlying unsaid comment is that, "we like the GOP portions of this proposal, but we need to work on the Dem portions as they are concerning to us." We will see how serious the Republicans are once they get back to work, IF they get back to work! No jobs bills put forth from the party who campaigned on jobs during the 2010 election. Me thinks Eric Cantor has started to read his polling and press clippings and neither one are very good. Many Americans think that the GOP is purposely trying to allow the economy to tank just for political gain and the Congress 13% approval rating overall along with Republicans and Tea Party polling lower than both the POTUS and the Democrats show this. Plus his little stunt about replacing funds to help those in need after the storms didn't go over well either. Time to turn over a new leaf? I'll believe it when I really see it. Cantor and Boehner are the real problem here. They are either too terrified of their Tea Party Frankenstein, or too locked in to right-wing extremist ideology to do what is right for America. Watch- they will both spin around to saying something like: "same, old tired ideas, that didn't work,blah, blah, blah", then they will either go back to denting their own ideas (as laid out by Obama. See the real problem is the GOP/TP doesn't care about Americans- and their only ideas are give ever more welfare to the rich, let corporations take advantage of their employees, and foul the environment. Meanwhile be sure to cause even greater unemployment by cutting state and federal budgets. That to an economic recovery is-MAKE IT WORSE. After the damage done by Cantor during the ceiling limit increase he wants to compromise. Why is it that every "political ticker" item has the next GOP debate embedded in it??? Please stop! If we want to watch the debate, we will, if we don't (much like the GOP response to President Obama's speech) we won't. There is enough info about these non-events that you don't have to jam it down our throats!!! Translation: The GOP will call it "compromise" when they say "we get all the parts we like and you get none of the parts you like." Last night during the President's speech, the Republicans showed us they have nothing new and still have the no way no how attitude. They all sat on their lead asses with their stone faces and stinky breath. Disgusting attitudes really. It was a pathetic sight to see him walking directly behind the President. It gave new meaning to the word backstabber. Its nice to see Cantor acting like an adult for a change. Cantor should realize not even counting the preexisting role the GOP had that created this economic situation in the first place with deregulations and toxic assets, Just look at their current work and his "leadership" i n the debt ceiling debacle which led us to loose our AAA rating. Then, their part in NOT putting forth any jobs legislation as they promised in the mid-term elections Where is the jobs legislation that they promised??? I guess Cantor and the other GOP/Tea Baggers in Congress realize they are up for re election next year and have to answer to the people. He's playing nice today since he was scrutinized over his hateful comments last week regarding assistance to the hurrican victims. No matter what, he will still say NO. What I find most despicable about Cantor is his hypocrisy. He is everything that is wrong in Washington, from Congress to the political talking head pundits (on both sides of the aisle). Not one of these fools have EVER had the best interest of America in mind ... most are either vying for campaign dollars, political votes, or advertising dollars. Greed and power. Nothing more, nothing less. It is my fervent wish that Cantor is given the boot in 2012. No loss there. He'll make a fine lobbyist. I don't trust anything Cantor says. It's still all about him and power for the Republican party. He and the rest of them make me sick. No he doesn't. Cantor doesn't see any common ground. What he sees are his party's own ideas, repackaged and being put forth by the other party's President. He's smart enough to know that it would be the height of hypocrisy (once again) to decry President Obama's proposals. Cantor doesn't know what common ground is. It is in the middle, which isn't where Cantor is going. Republicans will NEVER work with our president NEVER because they will never accept him as OUR president. Sad but true. They have only one intention and that is to GET RID OF THE "DIFFERENT" looking president. Can't trust Cantor or anything he says. He just wants people to think he is willing to compromise but it will never happen. I want to see how long it wil take before the Republicans move to put into action anything that was put on the table by the President last night. To try to push their candidates maybe they will try to make themselves look good around September 2012 to con the voters.